Objective The primary objective of the study was to measure the impact of an observational pain assessment dementia tool on time from ED arrival to first dose of analgesic medicine. Methods A multisite cluster randomised controlled trial was conducted to test the Pain Assessment in Advanced Dementia (PAINAD) tool. Patients aged 65 years or older suspected of a long bone fracture were screened for cognitive impairment using the Six-Item Screening (SIS) tool. Patients scoring 4 or less on SIS (intervention sites) were assessed for pain using PAINAD. Control sites, assessed pain using standard methods. The primary outcome was time to first dose of analgesia and was analysed on an intention-to-treat basis with a sensitivity analysis. Results We enrolled 602 patients, of which 323 (54%) were at intervention sites (n=4). The median time to analgesia was 82 min (IQR 45–151 min). There was no statistically significant difference in median time to analgesia for intervention 83 (IQR 48–158 min) and non-intervention 82 min (IQR 41–147 min) sites (p=0.414). After adjusting for age, fracture type, arrival mode and triage category, there remained no significant difference in time to analgesia (HR 0.97, 95% CI 0.80 to 1.17, p=0.74). Of the 602 patients enrolled, 273 actually had cognitive impairment. A sensitivity analysis demonstrated patients at intervention sites received analgesia 13 min sooner (90 vs 103 min, p=0.91). Conclusion Use of the PAINAD was not associated with a shorter time to analgesia, although there was a clinically important but non-significant improvement in the cognitively impaired patient group. Further research is needed to address this clinically important and complex issue. People with cognitive impairment wait longer for analgesia compared with other ED groups. Pain assessment tools have been shown to improve time to analgesia in such patients in non-ED settings. In this randomised clustered intervention trial, the use of the Pain Assessment in Advanced Dementia, a pain assessment tool for cognitively impaired adults, did not have a statistically significant impact on time to analgesia for the group as a whole, although a sensitivity analysis of only those with cognitive impairment showed a potentially clinically useful (but non-significant) difference. We suspect that there are additional workload and human factors in the ED that need to be considered in improving the delivery of analgesia to this population. We have previously shown that cognitively impaired older people with a long bone fracture wait significantly longer for commencement of analgesia in ED.4 ED clinicians, and in particular nursing staff, are the first responders to all patients, and pain assessment is part of this response. However, ED staff have identified a lack of confidence and familiarity with pain assessment in people with cognitive impairment, especially in those with dementia.6 Available guidelines indicate that timely analgesia is important, recognised as a human right and should be provided for those in severe pain within 20 min7 or within a maximum of 60 min2 from time of arrival in ED. Many researchers8–11 advocate for the use of observational pain assessment tools for people with dementia. Observational pain assessment tools, such as the Pain Assessment in Advanced Dementia (PAINAD), can improve pain recognition and intensity measurement by as much as 25%–42.5%.12 As a result, groups such as the US Medical Directors Association11 13 14 and the American Pain Society15 advocate for the adoption of PAINAD within clinical practice. PAINAD components and scoring system. PAINAD has been validated for use in several clinical settings.13 23 However, the scale has never been trialled in the ED setting. The aim of this research was to test whether the use of PAINAD would improve time to analgesia in hospital EDs for older people with cognitive impairment. A multicentre cluster randomised controlled trial (registration ACTRN 12613000997752) was conducted in eight metropolitan EDs in Sydney, Australia during the period of this study. The study period was March 2013 to June 2015 and during this time period there were 340 891 ED presentations. Approval was obtained from all ethics and governance committees (LNR/12/HAWKE/416 Dec 2012). This study was conducted in accordance with the Declaration of Helsinki. The reporting of this study adheres to the Consort 2010 cluster randomised controlled trial checklist. EDs were randomised to receive the intervention (PAINAD) or usual care (figure 2). Australian EDs level 5 (urban district hospitals) and 6 (trauma major referral hospitals) are comparable with respect to attendance patterns, clinical leadership positions, undergraduate/postgraduate training, staff education programs, information systems, resources and staffing. Sydney metropolitan EDs self-selected for study inclusion. The eight EDs were placed into four pairs, pairing the two most closely matching EDs by characteristics such as annual number of presentations and hospital status (trauma major referral hospital or urban district hospital). The lead investigator with an independent witness randomised sites to the intervention or control using a balanced computer coin toss randomisation process. Randomisation and screening process. ITT, intention to treat; SIS, Six-Item Screening tool. Data collection included patient demographics (age, gender); clinical information (time of arrival to the ED, triage code, SIS, doctor seen by time, analgesics prescribed and time, discharge, diagnostic code and disposition). PAINAD scores were collected from intervention sites. Prior to the trial, an education programme was delivered across all sites and included dementia pain signs and symptoms, screening for cognitive impairment using the SIS and study protocol and data collection sheet.17 At intervention sites PAINAD education was added. The staff at intervention sites were not blinded to the intervention but were not informed about the primary outcome measure of the research in order to minimise the likelihood of bias. To accommodate staff rotations and annual leave, the programme was repeated every 4–6 weeks by either the lead investigator or site champion. Nurse managers and lead clinicians played a vital role in championing the trial across sites and regular in-service meetings were organised to facilitate education and study engagement. Across all sites, the bedside nurse screened patients for cognitive impairment using the SIS prior to a routine pain assessment. In the non-intervention sites, pain assessment was performed according to usual care. 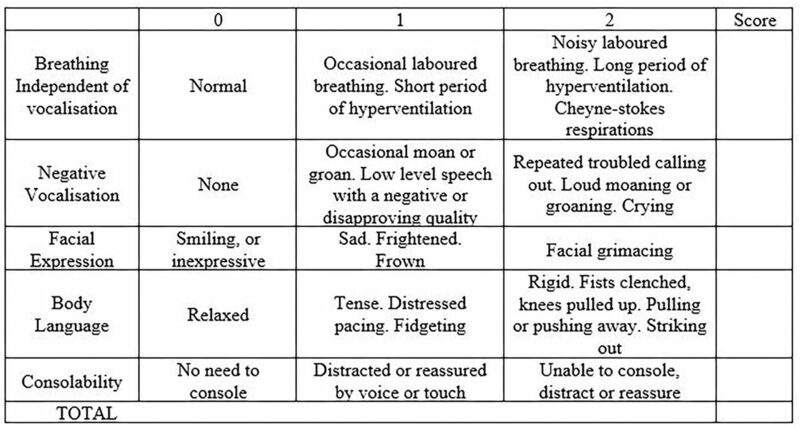 In Australian EDs, a verbal rating scale or a visual analogue scale is the usual pain assessment method for adults.25 At intervention sites, a SIS score of 4 or less required the nurse to use the PAINAD to assess pain. Time from ED arrival to first dose of analgesic medicine administered. Analgesia included oral or parenteral medication. Data were collected by manually examining the patient’s medical and e-Health records. Proportion of patients administered pain medication within 60 min; proportion of patients receiving no analgesia comparing time of arrival with medicine’s documentation. The main analysis conducted was intention-to-treat (basis) with a sensitivity analysis including only those patients in which cognitive impairment was documented and verifiable. Descriptive statistics were used to describe the study population. The Mann-Whitney U test was used to determine the primary outcome and Pearson’s Χ2 test to determine differences in proportions for secondary outcomes. We then used a Cox regression analysis for time to analgesia and binary logistic regression for the proportion of patients receiving pain medication within 60 min, with both adjusting for confounders of age, fracture type, arrival mode and triage category. Statistical analysis was conducted with IBM SPSS V.21 software. Across the study period we enrolled 602 patients. The median time to analgesia was 82 min (IQR 45–151 min); analgesia was provided to 180 (30%) patients within 60 min of being triaged. Of the 602 patients, 271 (45%) had cognitive impairment documented and verified (SIS 4 or less). We therefore present the results in two groups: an intention to treat analysis of the 602 patients, and a sensitivity analysis of the 271 patients. There were 323 (54%) patients at intervention sites and 279 (46%) at non-intervention sites. Table 1 describes patient details, showing considerable baseline differences between the groups despite the randomisation process. Patients at the intervention sites were older, more likely to arrive by ambulance and had a different fracture pattern than those at control sites. Intervention sites were also almost twice as likely to apply a low triage urgency code to patients (43% vs 25% of patients with ATS 4), which was statistically significant (Χ2, p=0.001). Intervention sites documented pain scores more frequently (p=0.03), but patients were no more likely to receive analgesia within 60 min (p=0.190) when compared with control sites. On univariate analysis, there was no difference in the time to analgesia between the intervention and control groups (median 83 (IQR 48–158) min vs 82 (41–147) min, p=0.42). After adjusting for age, fracture type, arrival mode and triage category in a Cox regression model, there was no significant difference in time to analgesia between the two groups (HR 0.97, 95% CI 0.80 to 1.17, p 0.74). When time to analgesia was dichotomised based on whether analgesia was received within 60 min, 28% of intervention and 32% of control patient (p=0.190) received analgesia within this benchmark. In a binary logistic model, again adjusting for baseline imbalances at the sites, no difference in the proportion receiving analgesia within 60 min was found (p=0.91). Overall, 63 patients (10%) did not receive an analgesic by ambulance officers or in the ED. There was no difference between sites (p=0.90). The majority (n=503; 83.5%) of patients required surgery and hospital admission. Of the 271 patients with cognitive impairment, 157 (58.0%) were enrolled from intervention sites and 114 from control sites (42%) (table 2). Of these, 136 (87.0%) had a PAINAD completed with a median PAINAD score of 2 (IQR 0–4.0). As seen in the larger cohort, patients in the intervention group were older and more likely to have a low triage acuity. At the intervention sites, patients received analgesia a median of 13 min sooner, but it was not statistically significant (90 vs 103 min, p=0.62). Only 22% of intervention and 23% of control patients received analgesia within 60 min of arrival (p=0.92). No difference for time to analgesia between the groups was found after adjusting for covariates (HR 0.87, 95% CI 0.63 to 1.20, p=0.40). In this randomised controlled trial, we did not find a statistically significant difference for time to analgesia with use of PAINAD. While the education programme delivered across sites may have contributed to the sensitivity analysis findings, our results confirm substantial analgesic delay continues and highlights the difficulty of providing timely analgesia to older people with cognitive impairment and an acutely painful condition. This is another wake up call to emergency practitioners concerning analgesic provision in vulnerable populations. There were considerable baseline differences between the groups despite the randomisation process. Patients at the intervention sites were older, more likely to arrive by ambulance and had a different fracture pattern than those at control sites. Of particular note, intervention sites were also almost twice as likely to apply a low triage urgency code to patients (43% vs 25% of patients with ATS 4). The lower triage codes may have had an impact on the outcomes of this study as code allocation has been shown to impact on time to analgesia.26 27 In this study, routine triage processes occurred, although research suggests that pain in cognitively impaired people is often under-recognised. Consequently, the findings may have been different had the triage nurse used the PAINAD tool. EDs are committed to pain management despite studies reporting analgesic delay for people with cognitive impairment.4 For this trial, PAINAD was implemented based on the assumption that better recognition and measurement of pain intensity would improve analgesic delivery. While overcrowding, age, triage category and gender have been identified as predictors for analgesic delay, no study has tested the assumption that observational pain assessment tools improve time to analgesia. PAINAD has been tested but always with a focus on pain assessment rather than medication delivery.12 18 This study highlights that a tool alone is not sufficient to change practice and that individual judgement and/or the organisational environment may also be a factor influencing clinician behaviour. Consequently, the use of screening tools may only be one factor in achieving behaviour change. This study highlights, however, that implementation of an evidence-based pain assessment tool is complex and that EDs may require individual multifactorial implementation considerations such as cultural, transdisciplinary and human factors to improve pain management of people with cognitive impairment. More importantly, the findings highlight two challenges; not just the imperative to improve suboptimal care for an obvious painful condition, but the necessity to detect pain in people with cognitive impairment, especially dementia, presenting with a range of conditions and injuries. There are a number of limitations with this study. Missing data in small numbers of patients, which may have resulted from competing nurse workload, could have influenced study findings. EDs were invited to enrol in the study so self-nomination may have influenced findings. The small number of clusters may have accounted for the difference in baseline populations and failure to reach statistical significance. 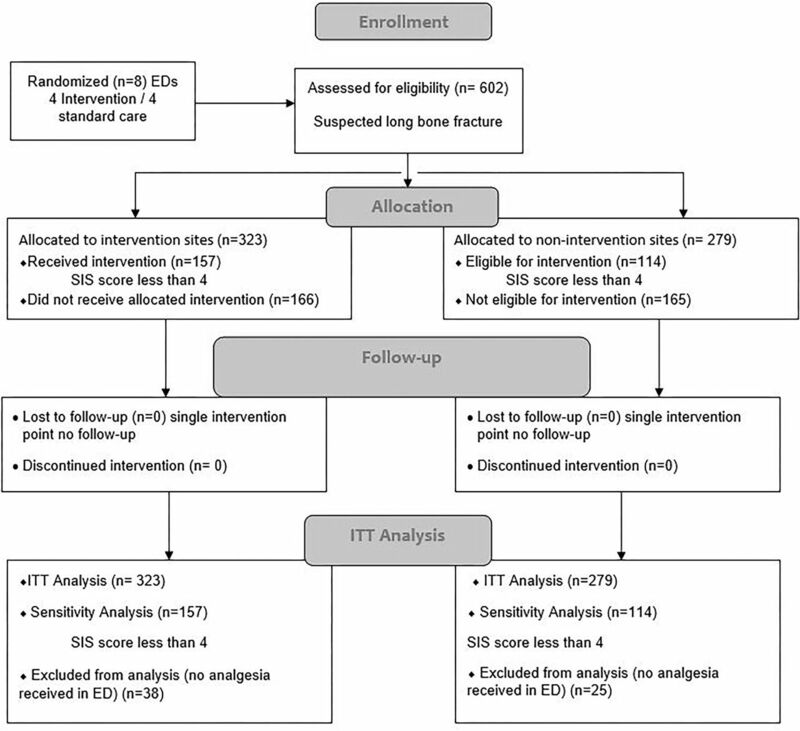 The screening of suspected long bone fractures by nurses, using the SIS, may have been influenced by workload and introduced bias into the study. A multidisciplinary team approach may have altered the findings. Hence, a larger powered multidisciplinary study that uses independent research staff to collect data is needed. Cognitive impairment was not independently verifiable in over half the patients and this may have led to sample bias. The study did not determine the appropriateness of the analgesic medication and this is an area for further investigation. In this multi-centre cluster randomised controlled trial, the use of the PAINAD tool did not result in a statistically significant reduction in time to analgesia in older people with suspected long bone fracture and cognitive impairment. The long delays to analgesia observed in both study arms suggest further trials are warranted and highlighted that pain management is complex when communication barriers exist. National Palliative Care Program. The PMG kit for Aged care. Canberra: Australian Government Department of Health and Ageing, 2007.
, et al . eds. Acute pain management: scientific evidence. 4th ed: Australian and New Zealand College of Anaesthetists and Faculty of Pain Medicine, 2015. Australian and New Zealand College of Anaesthetists and Faculty of Pain Medicine. Acute pain management: scientific evidence. Melbourne: Australian and New Zealand College of Anaesthetists, 2005. Contributors MF, LC and GA conceived the study, designed the trial and obtained the research funding. MF, LC and GA supervised the conduct of the trial and data collection. MF oversaw recruitment of participating sites and managed the quality of data collection. GA provided statistical advice on the study design, sample and analysis of the data. MF, LC and GA were involved in the drafting and revision of the manuscript. MF takes responsibility for the paper as a whole. Funding This research was supported by the Emergency Care Institute and the Agency for Clinical Innovation (ACI/D12/1275) New South Wales. Neither body has had any role in the conduct of the research nor the preparation of the manuscript. Ethics approval Approval was obtained from the hospitals’ health districts’ Human Research Ethics Committees (HREC 1212-430M) and operated according to the guidelines of the National Health and Medical Research Council of Australia. Data sharing statement According to ethical requirements data sharing is not available.